The news of NASA's discovery of flowing water on Mars is timely for Ridley Scott and his latest space-based survival feature 'The Martian'. 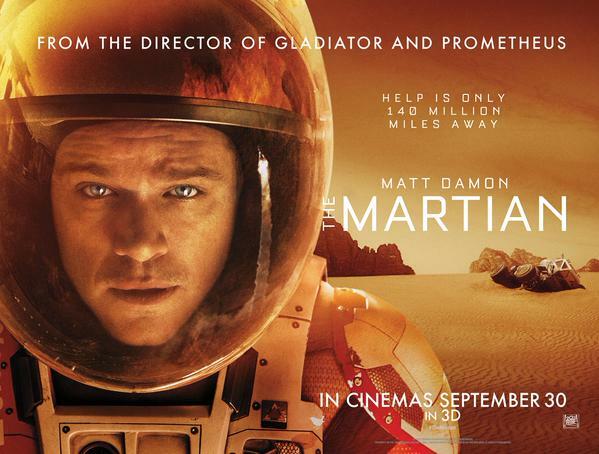 The 'Alien' director adapts Andy Weir's 2011 novel, with Matt Damon as an astronaut left behind on a Mars mission, having been presumed dead. In terms of its two most recent high-profile contemporaries, 'The Martian' doesn't quite have the tension and peril as 'Gravity' nor the same level of intrigue as 'Interstellar'. However, screenwriter Drew Goddard offers a similar sharpness in his script to the humour that won the original novel praise, delivered with aplomb by Damon, who carries much of the film on his Martian shoulders. Craig Roberts is perhaps best known for his work as the lead in Richard Ayoade's 'Submarine', and evokes much of his collaborator in his debut feature, 'Just Jim'. Roberts also stars as the central character, an outsider, whose downtrodden suburban Welsh life takes a turn with the introduction of a charismatic American neighbour, played by Emile Hirsch. 'Just Jim' is particularly reminiscent of Ayoade's oddball-yet-somewhat-sinister second film 'The Double', in which Roberts also features. The surrealist humour doesn't always land, although 'Just Jim' does feel like a confident writer-director debut. Probably the strangest coming-of-age tale you'll see all year. The 'Grand Theft Auto' video game series has become a pop culture phenomenon, building from humble beginnings in late 1990s Scotland. BBC drama 'The Gamechangers' (watch on iPlayer for a limited time) opts to focus on the post-'Grand Theft Auto III' period, with Daniel Radcliffe starring as the driving force of the game's makers Rockstar Games, who wanted to push gaming beyond what film could do. The series' longstanding relationship with on-screen graphic violence is largely explored through a series of legal battles, lending some reminiscence to 'The Social Network'. The programme's glossy approach seems at odds with the murky litigation-heavy world and Dundee-based roots from which the game spawned but is a complementary watch for those who have been interested in the video game series. The 2015 BFI London Film Festival is imminent. Peruse the programme and snap up any last minute tickets at bfi.org.uk/lff. In most unexpected news, Slipknot's Corey Taylor will be lending his vocals to this Saturday's episode of 'Doctor Who'.